Will orgonite cut out wifi and 3g/4g/5g/mobile phone signals completely? Scientifically speaking, although orgonite scavenges EMR/EMF, it will not completely eliminate it to create a black spot like a Faraday cage would. If it did, it would be classified as a mobile phone jammer and be made illegal. However, depending on the size of the piece, you may notice a reduction or loss of phone/wifi signal within a few inches of it. EMR/EMF seem to disrupt etheric energy (known as orgone, prana, chi or life force energy), causing it to stagnate and go bad. In addition to the physical scavenging, orgonite seems to not only restore the disrupted flow of natural etheric energy, but also enhance it. With regards to orgonite physically scavenging EMR/EMF (such as wifi, bluetooth, 3g, 4g, 5g, etc), it is thought that the metal shavings insulated from each other by resin in orgonite act as electrical inductors, conducting and storing electromagnetic radiation (EMR) from the surrounding area. The embedded quartz crystal converts this electromagnetic charge from the inductor matrix into small movements, via the process of electrostriction. With regards to orgonite restoring the natural etheric energy (orgone, prana, chi or life force energy), water is thought to be a superconductor for etheric energy, and certain types of EMR could possibly split moisture in the air into hydrogen ions and hydroxyl ions (H+ and OH-), neutralising or at least disrupting the natural transmission and flow of etheric energy. Placing orgonite in the vicinity of sources of EMR could essentially lift the sterilising effect of the EMR, enabling orgone or chi to function properly again. In addition to restoring the natural flow of etheric energy, orgonite then enhances it. Very little is known about how etheric energy works, and exactly how orgonite interacts with it, but the general theory is that the organic material in orgonite’s matrix (resin) attracts negative orgone energy, and the inorganic material (metal) repels it. Once attracted to the matrix, it has both pulling and pushing forces applied to it from all directions at the same time, causing friction. This chaotic, scrambled energy is then cleansed and converted into positive orgone energy via the embedded quartz crystal. Large electrical appliances, and wireless transmission devices specifically (such as mobile phone masts or wifi routers) seem to generate large amounts of negative orgone. This is sucked in by orgonite, and transformed into positive orgone. I am concerned about the effects of wifi and mobile phone signals in my home, which pieces do you recommend? If you are constrained by budget, 12 or 24 field grade orgonite tower busters scattered around inside and outside the property is the most cost effective way to make an impact. However, please note that these are really made for use outside, and are a little rough - they could scratch worksurfaces, so you would need to use coasters or other materials as barriers to surfaces. If budget allows, one or two of the 17 piece bundle deals would be the most ideal solution. The deal price is significantly less than purchasing the pieces separately. Double terminated Lemurian seed quartz crystals - master crystals, and able to communicate with other crystals. Naturally double terminated crystals can simultaneously absorb and transmit energy. This bi-directional transfer of energy facilitates energy exchange between chakras, and is especially useful in balancing energies between two people. 24-karat gold flakes - often referred to as the master healer, able to clear negativity from chakras and energy fields. Works very well with other gemstones, increasing their power while providing a stabilising influence on them. Selenite crystals - clearing, charging, and enhancing the properties of other crystals and stones in the piece. The personal pieces also have an increased processing capacity, and their materials are much more suited to use within personal spaces. The field grade pieces can be placed outside, and indoors in areas they won't cause damage to surfaces, and the personal pieces in areas where people congregate or spend most of their time, and close to electrical appliances, especially wireless devices. Why are your orgonite pieces more expensive/less expensive than others? Our orgonite pieces are made using the highest grade of materials, to the highest standard of construction. We are very precise about the type and grade of materials used, as well as the accurate positioning of them. We try and keep our prices fair, and as low as possible. Purchasing the parts separately for many of our pieces would cost at least as much as the piece itself, which includes labour and delivery. We consider some of the Lemurian crystals that we use pretty much priceless, including some of the double terminated cluster specimens, and double terminated record keepers with triangles on both terminations. They are rarely seen for sale, and command high premiums when they are. Our personal pieces are for placement in and around one’s personal space and property. Our field grade or tactical orgonite is more cost effective, and made to be distributed or “gifted” around the community and wider environment. Field grade orgonite is the cheapest to buy or make yourself, and functions well, but often is quite rough and not generally suited for personal use. Will you expand your range in the future? Yes, we are continuously working to innovate and improve. Please ensure you are signed up to our newsletter to be informed of new and updated items. 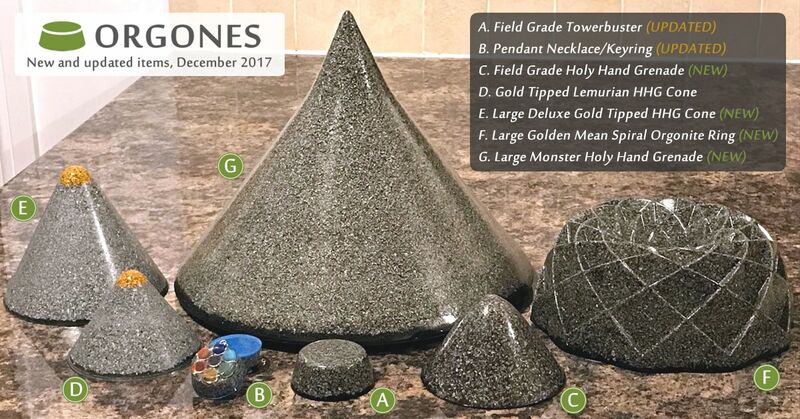 “Gifting” in the context of orgonite, is distributing orgonite pieces such as TBs (towerbusters) or HHGs (holy hand grenades) into the wider environment, in an attempt to help neutralise sources of negative orgone (particularly sources of EMF/EMR). The quality of the materials we use in our personal orgonite pieces is such that while they would function fine for gifting, they are really meant for personal use, and would be a bit overkill and wasteful of materials if distributed into the environment. Our personal orgonite pieces are suitable for personal gifting though; giving away to friends, family and even strangers, and make excellent mother’s day, father’s day, valentine’s day, birthday, anniversary or Christmas presents. Please see our field grade towerbusters for gifting orgonite. Orgone is a subtle energy, and is difficult to measure or quantify. 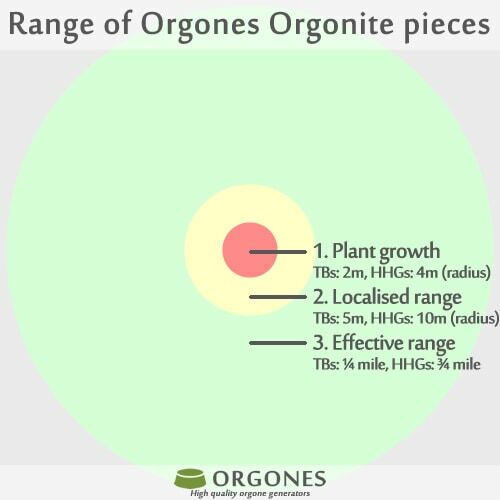 Reviewing the Guidelines, uses and benefits section of any of our orgonite items gives some ideas for placement and reported effects associated with orgonite pieces. The effects may not be instant and dramatic, but may become apparent after reviewing after a period of several months. Some have theorised that experiments in the field of quantum mechanics and quantum physics involving the Casimir effect may exhibit similarities to how orgonite functions. In one experiment, two conductive surfaces were placed very close to each other, but not touching. The gap between them was excited by microwaves, and photons were produced from the vaccum; essentially out of nothing. There are thousands of metal shavings in an orgonite piece, and many are very close without touching. We also know that orgonite is excited by, and scavenges/dissipates ambient EMF/EMR. However, the gap distance (or cavity length) involved in these experiments is very small, as small as 10nm, which is ten millionths of a millimetre. A human hair is 75,000nm. In addition, these experiments are conducted in a vacuum. So while it seems unlikely that the Casimir effect specifically has anything to do with the function of orgonite, it is worth reviewing information of this nature. Are crystals necessary for orgonite to function? The simple answer is yes, for orgonite to function as we know it, a quartz crystal must be present in the resin and metal matrix. One of the primary metaphysical functions of the quartz crystal is energy amplification; both positive and negative. If positive energy is happening, this will be amplified. If negative energy is happening, this will be amplified. However, we know that orgonite does not amplify negative energy; it converts negative energy into positive energy. It follows that if the matrix of organic and inorganic material in orgonite simply accumulated negative energy, the quartz crystal would amplify this negative energy. However, it does not output any negative energy at all, so the conversion is likely to take place in the metal and resin matrix, before being amplified by the crystal. Don Croft has long suspected this, and Carol Croft has observed it to be the case. Without a quartz crystal piece, the matrix of metal and resin would attract negative orgone energy, but as a relatively low powered processor, it is likely to become overwhelmed easily; attracting more negative orgone energy than it can process, and when it is processed, struggling to project it back out into the environment. This is why many people perceive a matrix of metal and resin on its own to be a negative orgone accumulator, when in fact there seems to be more to the story. Can I only use your pieces for applications other than their intended purpose? Absolutely! The arrangements and materials in our specialist pieces are designed for aiding specific issues, but such are the broad metaphysical properties of many gemstones, and unique nature of every Lemurian crystal, that they are well suited to more than one purpose. Intuition should be listened to and encouraged in this context, so if you are particularly drawn to a piece, have no reservations about keeping it close, even if you are using it for a different purpose. You may find that our Lemurian Cluster Sadness and Loneliness Aid piece is particularly helpful for restful sleep when left close to the bed at night, or that you are drawn to one piece in particular of the 7 Piece Lemurian Chakra Set, and decide to keep it in your pocket all day for mood elevation and wellbeing. This is all perfectly fine, and we are happy to hear about any such associations. I have accidentally dropped my orgonite piece, is it damaged now? No, unless the orgonite piece is smashed into pieces, it will continue to function perfectly fine. Any cosmetic damage such as markings, cracks or chips do not affect the function of the piece. In fact, a sudden jolt to the piece from accidentally dropping it can invigorate and stimulate orgonite. What range do your orgonite pieces have? All properly made orgonite pieces have what we approximate into three bands of ranges. The plant growth band is a smaller ring of intense positive orgone, where plant growth is affected. EMF/EMR scavenging is at its highest in this band. Reversing the negative effects that EMF/EMR has on subtle etheric energy/chi/orgone is at its highest in this band. The piece's contribution to the wider sea of etheric energy is also the highest in this band. The localised range band is a larger but less intense ring of positive orgone, where plant growth can be affected, but normally to a much lesser degree. EMF/EMR scavenging, reversing the negative effects that EMF/EMR has on subtle etheric energy, and the piece's contribution to the wider sea of etheric energy are all much reduced in this band. This is what we term as the effective range. Plant growth is not normally affected in this band. EMF/EMR scavenging is insignificant in this band, but reversing the negative effects that EMF/EMR has on subtle etheric energy, and the piece's contribution to the wider sea of etheric energy is still effective at this range. It is important to note that orgonite responds to the energy environment it is situated in, becoming more active when there is more negative orgone energy or EMR/EMF around it, and less active when there is less negative orgone energy or EMR/EMF around it. All orgonite devices also have a processing capacity, and can become overwhelmed in the presence of large areas or sources of negative orgone energy. This can generally be rectified with larger and/or additional pieces. The larger the mass of the orgonite piece, the more processing capacity it has. There is no reliable reproducible scientific way to measure orgone energy or the effect that orgonite has on it, so these bands are our best estimates from years of observation and research. An indoor example could be in a room where there is a wifi router, a TV and a computer. TBs or HHGs can be placed next to the router, TV and computer, and ideally a gold tipped HHG close to where people congregate or spend time. Pieces placed close to these electrical items will scavenge EMF/EMR, reverse the negative effects they have on etheric energy, and significantly impact the wider sea of etheric energy. This is especially significant when living in the same space as electrical equipment. An outdoor example could be placing a TB around 30 meters from a mobile phone mast. As long as the mast is the only significant piece of electrical equipment and source of EMF/EMR nearby, the TB will have a good effect on the negative effects of the mast on etheric energy, and have a good contribution to the wider sea of etheric energy. EMF/EMR scavenging will be minimal though. If there are other significant pieces of electrical equipment in the same area as the mast, then more pieces will be needed to be placed as close as possible to the mast. How do I clean my orgonite? Our orgonite pieces can be cleaned with a damp cloth, but can also be submerged in water and cleaned with water and a mild soap. We have not entered the field of weather modification devices, and have reservations about tampering with weather. There are concerns that such devices could potentially cause localised droughts if left operational for long periods. It is likely that cloudbusters do a great deal of good, and they are available for sale by other orgonite vendors, but we feel there needs to be detailed research undertaken with meteorological experts to assess the impact of CBs on short, medium and long term local weather patterns. Positioning, period of operation, timing, etc. are all variables that need to be investigated in detail. Do your orgonite pieces generate or convert orgone? Orgonite pieces are often referred to as orgone generators, orgonite, orgones, orgone convertors, orgonite devices or orgonite pieces. Whatever the name or terminology, orgonite is orgone processing material. It converts orgone from negative to positive, and is also thought to release orgone energy when stimulated by conventional forms of energy. How confident are you in your description of how orgonite works? The information in the How does orgonite work? section is the aggregation of theories from a number of different sources. There are almost certainly several different processes simultaneously at work in orgonite, and these theories are just our current best estimates at trying to explain the functions. Our understanding of how orgonite works is constantly evolving, so we will update this section with any credible new information as appropriate. Do you have any Kirlian photography of your orgonite pieces? Although Kirlian photos are pretty and intriguing, we are not convinced that the photographs are displaying orgone or chi energy. We are happy to review any such photographs though. Do you use copper coils in your orgonite pieces? As we use high quality cleansed master crystals in the form of double terminated Lemurian quartz crystals in all our orgonite, plus selenium in any personal pieces with gemstones, we do not feel there is any advantage to be gained by using copper coils. It is also relatively easy to make mistakes with copper coils (windings, lengths, direction, positioning) that could inadvertently result in negative results, however well intentioned. We do not use copper coils at all. Do you ever use silver in your orgonite pieces? Silver seems to give negative results when used in orgonite; we do not use silver at all. We do not make nano orgonite pieces; pieces made with this nano orgonite material have a much smaller effective range. Question marks remain over the efficiency and proper function of such devices, due to the larger density and surface area and how this relates to the amount of negative orgone energy attracted in relation to the quartz crystal content. We do use finer materials in some of our pieces, but they are not small enough to be classified as “nano”. It is difficult to track the source of this rumour, but it is likely to originate from a comment that Wilhelm Reich made in the context of his orgone accumulator box. His observation is thought to be that aluminium either attracted or repelled a large amount of negative orgone into or out from his orgone accumulator boxes. In the context of orgone accumulator boxes, people have reproduced these using aluminium, and observed no adverse effects. In the context of orgonite, attracting or repelling large amounts of negative orgone in a properly made orgonite device is a good thing; it is theorised that the way orgonite works is in part due to the organic material (resin) attracting negative orgone, and the inorganic material (metal) repelling it. So if there is any truth to Reich’s alleged observation about aluminium, this is likely why aluminium in orgonite works so well. It must be noted that one of the most prolific makers and gifters of orgonite in the world, Georg Ritschl, has gifted at least 30,000 tower busters made using aluminium. He has found no evidence for any negative effects from aluminium, and on the contrary believes it is the best metal for making strong orgonite. Most adults can not see orgone energy, but some energy sensitive people can see and/or feel it. It is thought that children and some animals such as dogs may be able to perceive it in some form too. Some adults who are not particularly energy sensitive have reported perceiving it only in very high concentrations. One report from a Chinese tai chi master detailed how he noticed orgonite push back shieh chi and leave a clear tsing chi zone that was good for meditation in personal space, and outside in the wider environment it changed sha chi to sheng chi. Both of these observations were made without him knowing what orgonite was. Can you make a custom piece for me? Delivery within mainland UK is free. To calculate delivery to offshore UK, USA, Europe and the rest of the world, just select your country at checkout. Unfortunately not; we only accept payment via the website. We can offer a full refund for undamaged products returned to us within 14 days of purchase. So if you change your mind within 14 days of purchase, please contact us for details of which postal/courier service to use, and where to send the package. With regret, we can not offer a refund for damaged products, and can not offer a refund for items purchased more than 14 days ago. Why hasn’t my order arrived? Please allow three working days before contacting us regarding undelivered orders within UK, and two weeks before contacting us for orders sent to USA, Europe and the rest of the world. Although the delivery aim is significantly less than these times, there can occasionally be misroutes, road closures, bad weather conditions or strike action that can affect delivery times. Do you provide VAT invoices? We are not currently VAT registered, so we do not charge VAT on products sold. We are committed to keeping your details safe and secure. No customer details are stored online. Your details are used for the purpose of processing and delivering your order. We will NOT send you any further correspondence unless you specifically ask for it, or manually sign up to our newsletter. None of your personal details will be shared with or used by third parties. We comply with the data protection act. This data is encrypted and kept offline, and we have to store it for 6 years to comply with UK law. The only data stored by us are the details you provide us in order to process your order. All of this data is present on the invoice that we provide to you with the order, and you have the right to request a copy of this for up to 6 years from the order date. If you would like to make a complaint, please contact us. Do you offer discount codes like 10% off, 20% off, etc.? Our prices are as low as possible all the time, and margins are so tight that we can’t offer promotions such as this. We do offer quantity based bulk discounts on all items, and a 5% discount on the order total when paying via bank transfer. We do not offer an affiliate program. However, we do have a presence on both eBay and etsy, who offer affiliate-type programs. Please can I give you a tip? Your kindness is very much appreciated. Can I come and visit or collect items? Sadly we do not yet have the facilities to offer this kind of service. I am interested in bulk purchase/stocking and selling your products, do you offer bulk discount? All our items have quantity-based discount options in the shopping cart; please click the drop-down box at checkout to view the pricing for larger quantities.